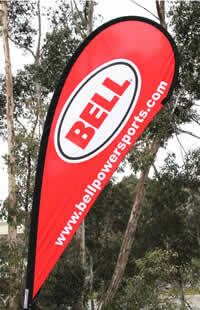 Marketing you business with teardrop banners is a superb way to popularize your business. It can be used to endorse your new company or spread some more awareness about your business. Teardrop banners can be great promotional medium because of its capacity to draw the attention of people around. No wonder, marketers are using this type of ad for attracting more and more customers. Teardrop banner ads can be set up anywhere near the road to appeal every pedestrian and driver. This kind of ad is available in several types of designs and sizes. However, you generally get to see the ones that are 2 to 4 m tall. These are generally made with prints on both sides, in order to ensure the promotion of your locality and business. You can use the same prints and designs on both sides of the banner or you may choose different layouts that you think will suit your business. When the breeze blows and these flap; they effortlessly get considerable amount of attention from the passersby. You can custom-design these banners with the logo of your company or any business tagline that you may have. You can also include graphic ads in your ad banners; this will make them more interesting and attractive. However, you should make sure that the graphics that you use are in keeping with the kind of products and services that your company offers. Teardrop banners are popularly used by businesses that show that they happen to be an outlet of a major brand. Teardrop banner ads are quite durable; hence, are apt at resisting strong snowfall or wind. This is because the bases of these advertisements are secured to the ground, which make them handle storm, extreme rain and sun with ease. Besides these, there are many other advantages of using these banners. First among them is that these are portable; they can be carried in hands. So, when you are not using these, they can be stored easily within a small space. Secondly, these ad forms do not call for a huge set up and collapse process. Both the processes require only a few minutes and can be done by just one person. Teardrop ads are named so because they come in the shape of a tear drop. These are very easily mounted up on a weighted pole, much like you do in case of a flag. The banners are stiff around the edges making the signage easier to comprehend. These advertisements should ideally be placed at a place that is frequented by people, like, parks, beaches, shopping malls, railway stations, etc. While using this form of advertisement, you also need to make sure that your image is clearly visible from all the directions. It can also be used to express appreciation for your specific target market. Teardrop ads are truly innovative and 'element defying'. 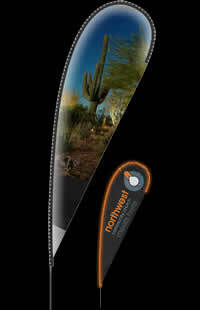 It is certainly not without a reason that teardrop banners are such a hit in the indoor and outdoor marketing sphere. Make sure you use these for your business too.